Hopefully this method should cover most details needed for a basic installation of nextcloud on a synology diskstation dsm 6. If you know something that might be helpful don’t hesitate to tell me. Btw this tutorial should work for owncloud as well. I have my own domain so I wanted to point it straight to my nextcloud installation. I will explain both setups in step 3. 3. (Basic setup – no virtual host). Go to General Settings and choose Apache 2.4 as back-end and Php 7.0 as PHP version. 3. (Alternative setup for using a virtual host). 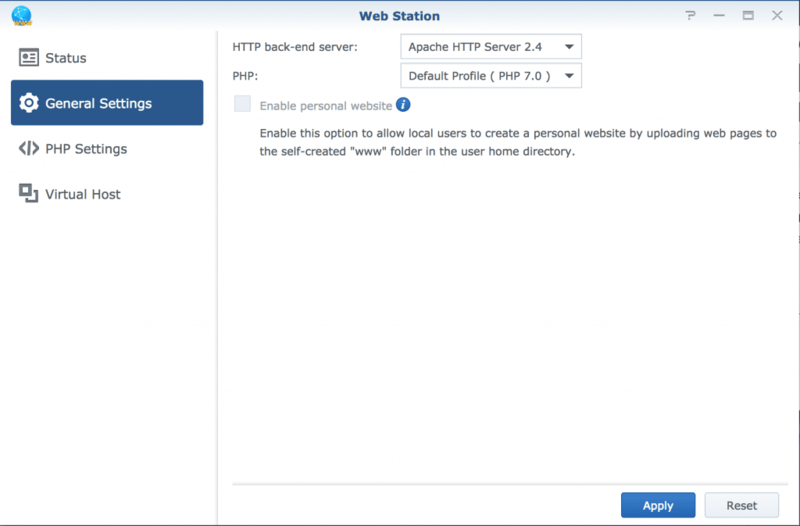 Choose Apache 2.4 for HTTP Back-end, and PHP 7.0 for PHP version. Click OK and your virtual host is set up. The next steps are the same for both setups. Only thing to keep in mind is your chosen installation folder. 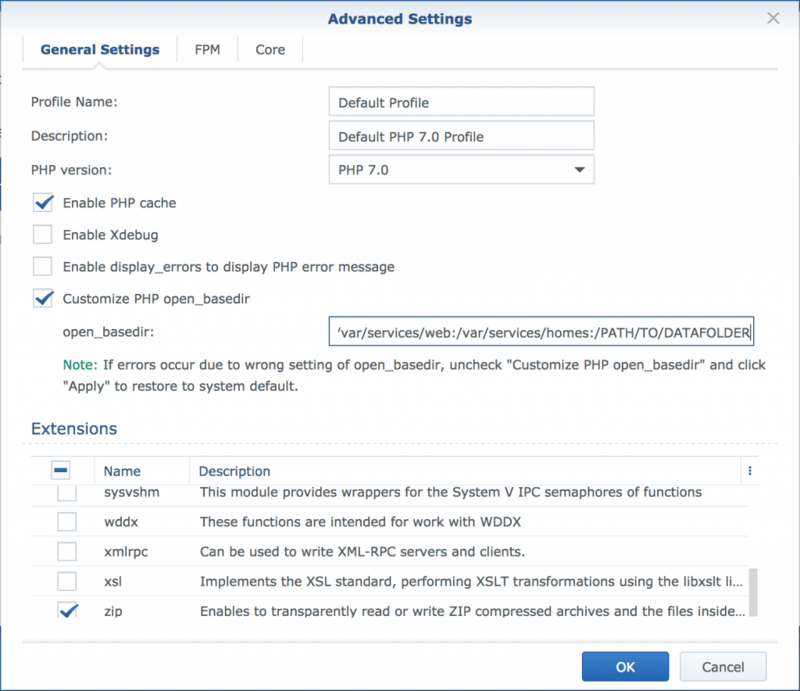 Go to PHP Settings and select PHP 7.0 and Edit. First select “Customise PHP open_basedir” This is so that you can customise where to put your nextcloud data-folder (where you will keep all your personal files). It’s a good idea to keep your data folder away from your nextcloud installation. At the end of the open_basedir: type a semi colon and enter the path to your data folder (see image). Now you have prepared an environment where nextcloud should work. The next steps are the actual installation steps. Place the nextcloud.zip in the root of your web folder (/volume1/web/) and unzip it there. Open a text editor and paste the following text. Edit the paths to match your environment. Save your script as permissions.sh and upload it to your synology nas. when prompted, type your admin password and press enter. If all is good you should find your self at the installation page for Nextcloud. If your page is blank or you get an error, make sure apache 2.4 and php 7 are selected in your web station/virtual host and not nginx. enter the username and password that you chose earlier in step 2.
choose any name for the database, just no spaces or leave it for default. If you are behind a firewall, make sure to port forward at least port 80 to your synology dsm to give access to your Nextcloud installation. If you are planning on using https, you need to forward port 443 as well. A good practice is to use https on any web site unless the access to your website is only on a local network. Synology has built in let’s encrypt which support great and free ssl certificates. go to control panel and security, certificate and click “add”. For the domain name, either you can use your synology quick access name or you can use your own domain, just make sure your domain is pointing to your diskstation. Unless you are using subdomains, just leave the “Subject Alternative Name:” blank. Go to your nextcloud installation folder and edit config.php in the config folder. Find the overwrite.cli.url value and change the http to https. If you can’t find MariaDB once you’ve arrived at the nextcloud installation screen, make sure that MariaDB is installed and that you have changed the PHP 7 value according to step 5 to 3307. If for some reason it refuses to save 3307 and defaults to 3306 (which is mariadb 5). Try to install MariaDB 5 as well. This might make it visible for nextcloud. 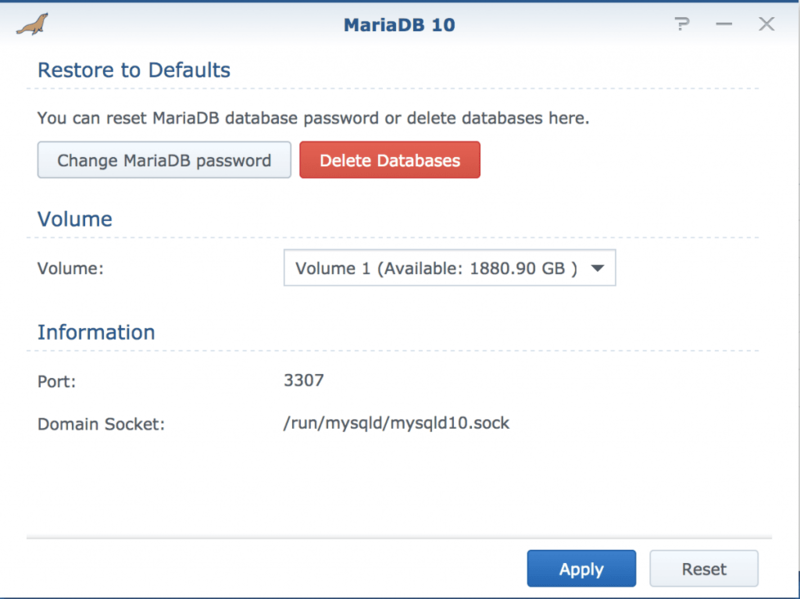 You should still be able to choose 127.0.0.1:3307 for host, to force it to use MariaDB 10. If not, you might consider trying MariaBD 5. Screen blank or error 503 or others. I was shown several error pages during my trial and errors. Most of them where connected to Nginx, permissions or the PHP 7 -settings. Nginx is not used in this tutorial so if you get nginx errors, try changing any value where nginx is selected to apache 2.4 in web station. If it’s a permission problem, check the permissions.sh file and make sure it has the correct paths. Also make sure that “Customise PHP open_basedir” is correct according to step 4.
the PHP 7 -settings. Nginx is not used in this tutorial so if you get nginx errors, try changing any value where nginx is selected to apache 2.4 in web station. If it’s a permission problem, check the permissions.sh file and make sure it has the correct paths. Also make sure that “Customise PHP open_basedir” is correct according to step 4. I want to change the default ports 80, 443 to 880 and 4443 since I am already port forwarding 80 internally for a media server and 443 for a VPN server. The question is what are the config files that I would have to do this with? Apache? PHP? Any guides or references on this would be appreciated. Hi GB, sorry for my late reply. I would set it up using virtual hosts as explained in step 3. If you need to use a different port (which you most likely wont if you just set it up to use virtual host) instead of clicking the default port 80, choose your own ports right below for both http and https. That should do the trick. Hey Michael, sorry for the late reply. 1. Nextcloud doesn’t really “care” which hostnames you use. You set the www root directory for the new hostname in webstation. After that make sure that the nextcloud folder is in that directory. That should be enough. 2. This I have no clue about I’m afraid. Can you ta a screenshot and link to it so I can see what the settings look like? Hi Brenna. Not sure I’m going to be a good help for you. There are a few different ways to do this. There are plugins that let your site detect if your visitors are using a mobile device and can “redirect” them to a special theme made for a mobile devices. That’s how most people used to do it. Today the most common way is just to look for a responsive theme that you like, which means that the page will resize itself depending on the size of the screen. But they can look “weird” if you have lots of content that doesn’t work with smaller screens. You can also choose to not display certain elements depending on the screen size by setting css rules. I don’t know if that helps. Cheers! Thanks you very much for your tutorial. With your help, I succeeded to install Nextcloud 13 on my NAS Synology 713+. After I custumized my config/config.php file, Nextcloud displayed an error message : impossible to use it. But after I used again the permissions.sh script, the problem disappeared. I 100% sure that I missed something since I’m a total beginer.. Does theses errors can help you to point me my mistake ? However, I don’t seem to get it working. I get the screen and everything seems to work (although I didn’t test to much). Any idea what I should check? Hi, It looks like you might have gotten a few random characters and line breaks in the permissions.sh file. Maybe copying the text from the browser didn’t work correctly. Send me a pm through the contact page or chat bubble and I can send you the file as a zip. It should work. I think the problem might be related to quickconnect. I rarely use it since it rarely works for anything except connecting to the DSM. I would try using DDNS in the control panel > external access > DDNS and add a xxxxx.synology.me domain. Then try connecting to xxxxx.synology.me/nextcloud and see if that works. Regarding your lan there could be multiple reasons for this. Have you set up a virtualhost? if so you could add that virtual host to your /etc/hosts file on your computer if it’s linux/osx or you might be able to add it to your router depending on model. That way, you override any DNS queries and point it straight to your NAS. If you use Virtual host and want external access you would need to register that domain some where and you might need to enable nat loopback on your router if it doesn’t work. I don’t know if any of that helps, don’t hesitate to ask again or if I was unclear. Thank you so much for this. I now have a fully working Nextcloud installation on my Synology DS218+. I now want to make sure everything is backed up. 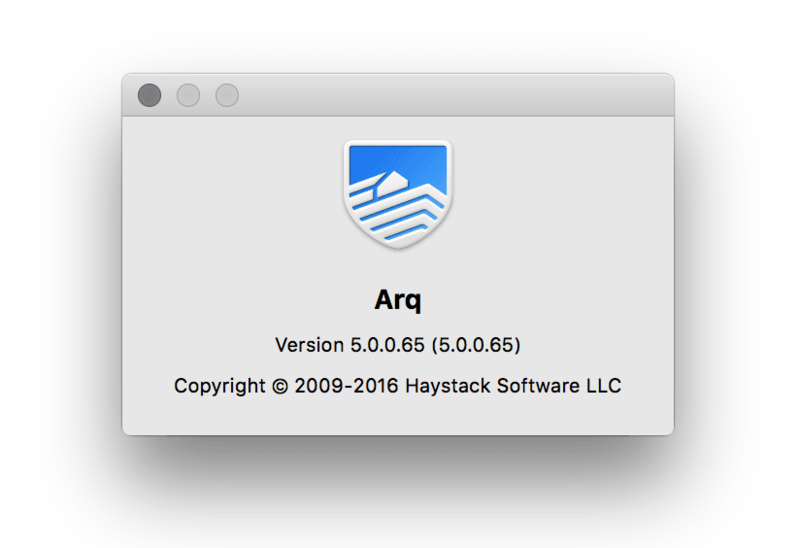 I use Hyperbackup to backup the whole web folder, and another to backup the app MariaDB. Am I doing enough to ensure my calendar and contacts are backed up? I’ve been searching so much online, but all I have found are instructions to backup a Linux based Nextcloud installation. I can’t adapt the instructions for a Synology install. I’m glad you found it helpful! Yes the web folder (and volume folder if placed somewhere else) and database is enough for backing up your installation. Just make sure to backup any encryption keys you have separately as well if you decide to use encryption on nextcloud, those won’t get backed up in the database. Other wise you should be good! Thank you David. Good to have confirmation that my backup strategy is sound! How would I do the setup if I want my programs (apache/mariadb, etc) on volume1 and my data on volume4. Now if you try to go to the /volume2/nextcloud/ directory in DSM you might get an error that you don’t have permissions for accessing it. Right click the directory, go to Properties and then Permission. Click create and add your account. There are a lot of resources online if you have troubles with changing the permissions of the directory. Just search for dsm permissions or something. I’ve gone through all the config files I can find and the only one remotely to do with the error says explicitly not to change anything above this line – and the line is right at the end of the file, lol! I seems liked to the fact that nextcloud is installed in a subfolder. As my nextcloud instance is installed in a subfolder named nextcloud, I resolve the issue with the following lines in my virtual host (running under Apache). It seems to be linked to the fact that nextcloud is installed in a subfolder. As my nextcloud instance is installed in a subfolder named nextcloud, I resolve the issue with the following lines in my virtual host (running under Apache). Interesting. I don’t run a virtual host – just a Synology DS218+ connected normally to the internet. The problem is there are plenty of solutions like yours but I have no idea where to put the comments suggested since the implementation of Nextcloud on a Synology NAS is rather different than on full Linux. None of the suggested configuration files seem to exist. Just a notice. Since updates, be them either Nextcloud or DSM, seem to break the Nextcloud installation in different ways for many, there is a “workaraound” that I’ve tried myself which is to install Synology’s Virtual Machine Manager. It’s not available for most DSM’s but is manually installable if you have a x86 DSM from here https://usdl.synology.com/download/Package/spk/Virtualization/ Download the latest version in the list and manually install it. After that you can install any flavor of Linux, I installed Ubuntu Server. Ubuntu server even has the option to install Nextcloud out of box and it just works. I can write a tutorial for it if anyone requests it. Thanks everyone for keeping this page alive. I’ve just looked at VMM and it is very limited – not only in relation to the NAS hardware but it also needs to be running BTRFS. What about using Docker? This seems to be much more accessible. I tried installing Nextcloud as Docker image – it all worked within my local network but I just couldn’t access it from outside. I think the problem may have been that my normally installed version of Nextcloud was still running. I don’t want to delete that just to try Docker. Since it’s all working apart from the OCS and OCM error messages I’ll stick with it. It appears the issue is affecting those who have a completely conventional Linux installation too so it’s a bigger problem that for those of us who have Nextcloud installed on out Diskstations. Thanks Philip for testing this out. I haven’t had time to do much testing lately (recently became the father of twins =)). I’ve been thinking about docker as well but there seemed to be other issues people ran into with the docker images so I discarded the idea at first, but maybe I’ll give it a go and see if I can get it running more fluidly. The Vm is working flawlessly for now but the problem is that the VM’s can’t share storage with DSM which is kind of dumb imo, you are correct that VMM is quite limited.. However very simple to setup. Congratulations on the twins David! You’ll certainly be very busy with them! Would be good if you could lend your expertise to a step-by-step Docker install of Nextcloud on a Synology NAS . . .
BTW I installed nano on my DS to make it easy to edit config files from within the ssh terminal window. Thanks Philip, I added these to the post below common errors. This will surely help many! Hi, thanks for the guide. I installed Nextcloud without any errors but I’m not able to reach the Cloud outside of the LAN or with the mobile app. Could you help me? I set up the DynDDNS with Synology, added the Lets encrypt certificate, enabled port forwarding in my router and edited the config.php with the dynddns Hostname. Did I miss something? What exacly do I have to put in as the address to find the cloud from outside? Are you using a virtual host? If you have not set up a virtual host, adding a domain name and pointing it to your nas simply adds an additional adress to your nas. 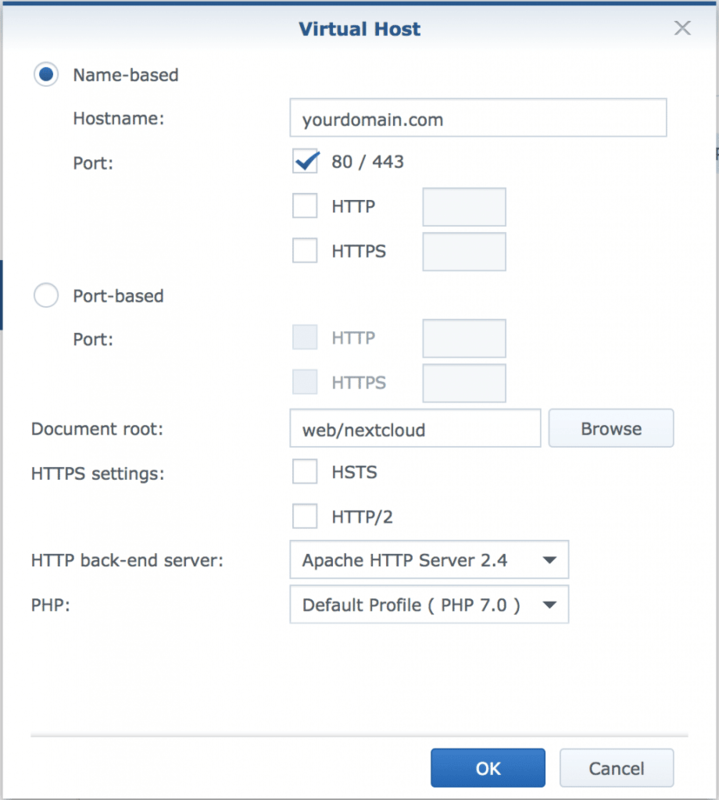 Let’s say your nas is nasdomain.com, then your nextcloud install should be in nasdomain.com/nextcloud (if you have named the folder in the base of your www-folder nextcloud) If you add a new domain and point it to your nas as well i.ex nascloud.com then the adress will simply be nascloud.com/nextcloud. 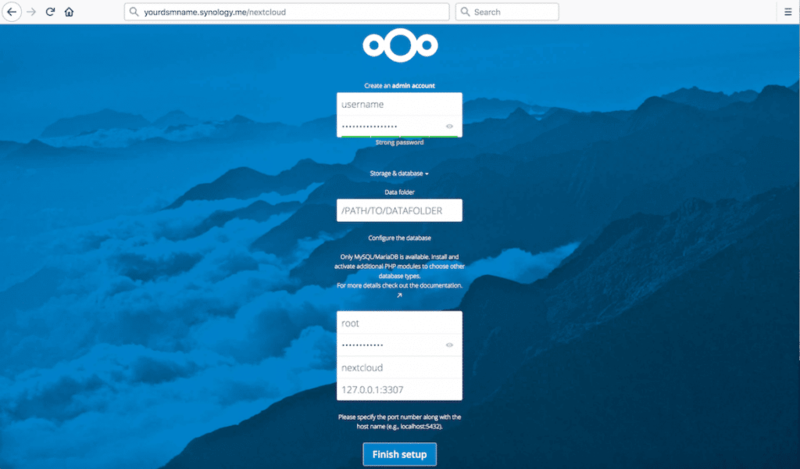 But if you have added a virtual host and pointed that host to your nextcloud folder, you should be able to access nextcloud by navigating to the domain directly. I hope this helps. Thanks for the quick reply David.. The problem was with my ISP. I had a DS-Lite connection, so no public IPv4 address. I got that fixed, so it should work, but I have another problem. Now when I want to connect via my the nextcloudapp on my phone it says untrusted domain. But I added my NAS domain in the config file of nextcloud so I’m a bit confused now why it doesnt work :/ I also added the Lets encrypt certificate. I read something about changing something in the apache config file but I’m not sure. Something about a redirecting something. Do you know anything about that problem? I’m glad you got the first part figured out! Hm.. untrusted definitely sounds like it has to do with ssl. Are you entering https://domain or just the domain when you connect through the app? Also when you connect through a normal browser, does the browser show that you are connected with https with a working ssl certificate from let’s encrypt? If the browser can connect and the ssl certificate is working, I can’t see why the app couldn’t unless you aren’t using ssl to connect. The app doesn’t necessarily know ssl is supposed to be used unless you enter it in the adress (https://domain). You can also make sure nextcloud redirect all traffic to https (Not sure if that helps the app though). There are a few ways to do it, I usually just use mod rewrite in .htaccess. There are tons of guides, just shout if you need any help. That’s all I can think of from the top of my mind. Hope something helps. Please post your solution, it might help someone else.